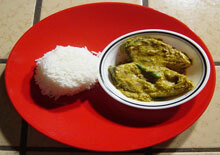 Curry with hilsa fish is a much admired delicacy among fish lovers in India and particularly among the Bengali people all over the world. Beside its taste, scientific studies have confirmed the beneficial heart healthy effect of fish oil (omega 3 fatty acid) in reducing bad cholesterol level. In this age of obesity and over weight problem, eating fish instead of red meat is an obvious alternative choice. In step one, the mustard seed will be ground with spices to create the sauce. In the second step this sauce will be used to marinate the fish. And finally, the marinated fish will be cooked. 1. 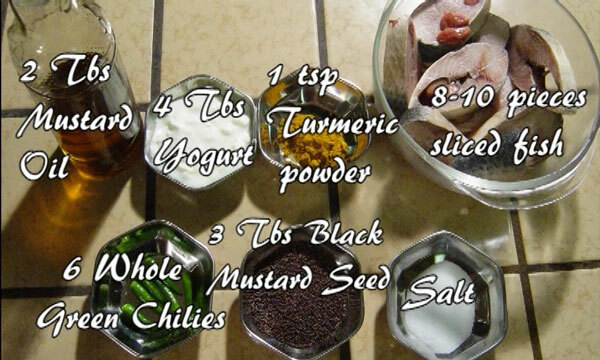 Put the whole black mustard seed in a grinder. 2. Add 2 green chilies. 4. Grind the dry mixture first. 5. Add 1/3 cup of water. 8. Transfer the mustard paste into a bowl. 9. Add 4 tablespoons of yogurt. 10. Mix with a spoon or ladle. 13. Add 2 tablespoons of mustard oil. 14. Again mix well to create a uniform marinating sauce. 15. Pour the sauce onto the fish. 16. And then marinate the fish pieces well either with a ladle or with hand. 17. Add a teaspoonful of oil to a medium hot pan. The purpose of this oil is to ensure that the fish. pieces do not stick to the hot pan. 18. Add the marinated fish pieces to the pan. 19. Pour and spread the remaining sauce on the fish. 20. Wash the leftover sauce with a small amount of water and add that to the pan. 21. Spread 4 green chilies on top. 22. Cover the pan and let it cook. 23. Occasionally loosen the fish pieces so they do not stick to the bottom. 24. After about 8 – 10 minutes of cooking, turn them over. 27. The remaining heat will complete the cooking. It takes about 30 – 35 minutes and serves 3 to 4 people. Serve the fish with steamed Basmati or Jasmin rice.